Green Kitchen Stories on Whole, Healthful Eating -- Plus a Giveaway! David Frenkiel and Luise Vindahl, the couple behind Green Kitchen Stories and this week's Guest Editors discuss how they're teaching their daughter to love whole, nutritious foods as much as they do. Plus, they're giving away 3 copies of their new book! What happens when a devoted, but not necessarily healthy, vegetarian meets a health-conscious omnivore? 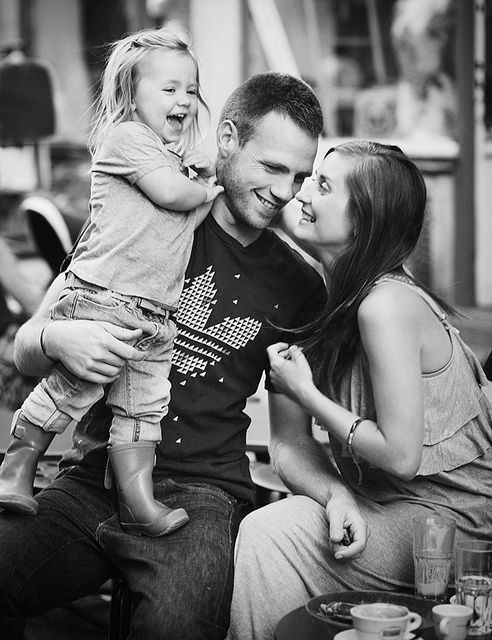 In the case of David Frenkiel and Luise Vindahl, they get married and meet in the middle. The result was less meat for Luise, more whole grains for David, and vegetable-heavy meals that were substantial enough to support a full day's activity. To document their culinary experiments, they started the blog Green Kitchen Stories. What dish have you cooked most this summer? It's been a warm summer in Sweden, so we have done lots of smoothies and juices with fresh berries. Luise likes to keep her smoothies green and fresh, but my (David's) favorite is this Strawberry Peanut Butter Milkshake. For lunch, we have repeatedly made the Broccoli & Pomegranate Salad from our book. And for breakfast we often prepare our flour-free Banana, Blueberry, and Coconut Pancakes. How have you had to adjust your cooking since having a child? How are you teaching her to love the same whole foods that you do? Oh, we could go on and on about this. But basically we have always tried to serve her the same food that we eat. We waited to introduce her to sugar, white bread, and milk products for as long as we could, which meant she learned to eat proper food from the beginning. We put a lot of effort into teaching her about all the different kinds of vegetables and fruit and bringing her to the market and into the kitchen. More: A wholesome breakfast that won't send kids on a sugary spiral. How has your cooking been influenced by your Scandinavian heritage and your life in Stockholm? Actually, surprisingly little. We are both crazy about traveling and spend most of our savings on seeing the world. Our cooking has therefore been influenced by all kinds of different cultures. One thing about Scandinavia that has influenced our cooking is, of course, the produce that surrounds us and the different seasons. Fresh berries and mushrooms grow in the forests outside of Stockholm during summer and autumn. And they are free for everyone to pick! Beets and other root vegetables are the only produce that can grow all year round in Sweden, so we have learned to prepare roots in a zillion different ways. On our blog you can find root soups, root chips, beet salads, and baked roots. We even use them in a chocolate cake. 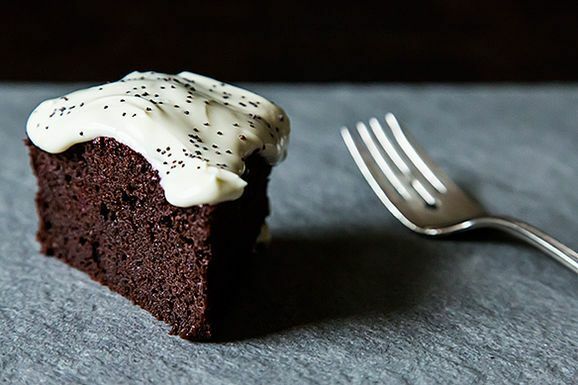 More: An extremely moist chocolate cake with one secret ingredient -- beets. What are the most important tricks and skills you've learned from each other in the kitchen? I (David) have never been good with leftovers; I always needed to go to the store before I started cooking. Luise, on the other hand, is amazing at creating a feast out of nothing. So she has inspired me to think twice before I go the store. Before we met I had never cooked with quinoa or whole grains -- she totally opened up that world to me. As for Luise, she wasn't a vegetarian when we met, so I guess I have "taught" her how to build up entirely plant-based meals. 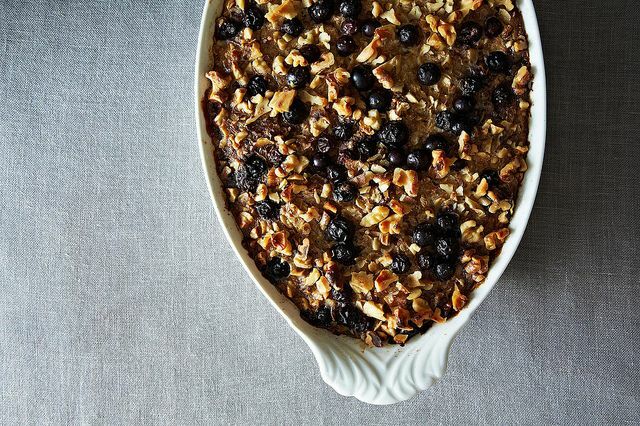 What's one basic recipe that every cook should know how to make? I guess it's good to know how to prepare breakfast in your sleep; it would be tough if you needed a cookbook every morning. Also, if you know how to make good pancakes you can always make new friends! 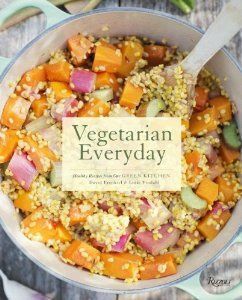 We're giving away 3 copies of Vegetarian Everyday! To enter, let us about your favorite vegetarian recipe in the comments below. We'll choose the lucky winners by this Friday, August 9th at 4 PM EST. Just one? :) Probably my all-time favorite is mujadara (one of the many variations of the name): rice and lentils with onions and cumin, usually served with fatoosh-like salad. One of my all-time favorites is veggie lasagna. I use anything I can get my hands on (eggplant, zucchini, squash, carrot) for the "noodles" and make a chunky, light tomato sauce to go with it. Lasagna is such a hearty meal, but when I do it this way it's rather light I can have it any time of the year! Love roasted asparagus done with olive oil and garlic. Just before serving grate with parmesan cheese. Yum! Pretty much anything and everything with avocado, though my favorite is a simple whole foods bowl consisting of quinoa, seasonal vegetables (sometimes fresh, sometime roasted, sometimes steamed, sometimes sauteed), LOTS of avocado, organic greens, freshly squeezed lemon juice, and an olive oil/balsamic dressing. And if you fancy, topped with some feta or lentils or chopped nuts. DELISH! My go-to vegetarian recipe is a roasted vegetable of any kind - easy and always good. I once found a garam masala recipe online somewhere and over the years it's just morphed into this great comfort food in our house. I'm not big on actually following recipes so I have no idea how closely it even resembles the original. And it's a one-pot kind of meal, which is always great - onions, garlic, garam masala spice, then tomatoes, veggie broth, lentiles and whatever other veggies you want to throw in there like zucchini. Throw it on some rice with crispy tofu on top... yum. I like polenta because it goes with just about any roasted vegetable on top. This summer I've become hooked on millet in my salads. I am vegetarian about 60-70% of the time and I don't know what I would do without fruits and vegetables in my life. My favourite vegetarian recipe recently has been Green Kitchen Stories' Green Lentil & Yellow Beet Salad. Beets are everywhere at the farmers markets now so I've made with (with both yellow and red beets) about 4 times already this summer. I add some chopped mint and toasted pistachios in mine. I even added sliced persimmon once! Corn and zucchini fritters with avocado salsa! Yummy!!! I absolutly love couscoussalad with grilled courgette, paprika, dades, fresh mint and pine nuts and then spiced op with some cumin. So simple but so tasteful. But for a special treat you can wake me up for the Raw dream cashew cake from My new roots! I am slowly transitioning to a vegetarian diet... and, my favorite dish is stuffed grape leaves!! And, start making my own pizza loaded with lots of veggies! Thanks for your site and the chance to enter! I have an infatuation with poached eggs. I think I could top any meal with one. I make a delicious barley, tomato, basil, and feta salad that I serve over greens with a poached egg on top. I also love a homemade pizza topped with an egg. I really could go on forever. Thanks for the giveaway! So many favorites it is hard to choose! I will go with my favorite as of late which is a thai curry tofu with pineapple served over brown rice. Discovered Green Kitchen Stories few month ago via www.cleacuisine.fr. Loving it I am hooked and want to try all of those recipes. Gorgeous pictures, delicious recipes. Favourite recipes falafel, Lentil soup and pink cheesecake. Thanks a million.